There is a dairy farm on that corner. There were two cows in the road, and many others… all over the place. We drove onto the property, hoping to find somebody. As our car crept slowly through the ever-expanding herd of dairy cows, we finally reached a barn with the light on. The farmer, who was accustomed to the sound of cows, poked his head out the door to see why a vehicle was outside his barn after dark. We had rolled down the windows to tell him about the cows, but in hindsight it was unnecessary. We shouted, “Your cows are…” and he was shouting for help before we finished the sentence. As we drove away, we could still hear him yelling. “Nobody knows how to close a gate around here…Cows all over hell…” My mom grinned and said, “You’re welcome,” knowing full well that the man was too shocked and upset to realize how we had helped. 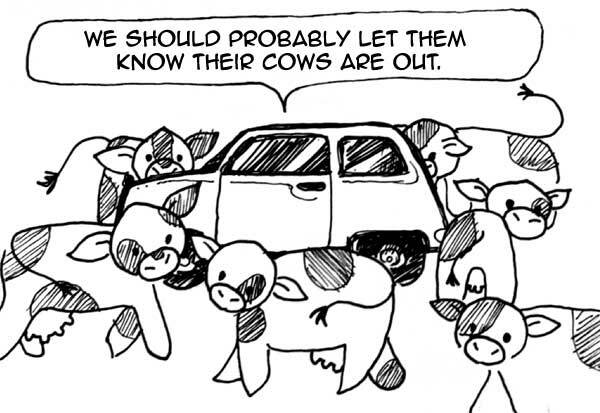 This entry was posted in Animals, Art, drawing, Humor and tagged cartoon, Cattle, cows, Dairy, Drawing, funny, Livestock, neighbors. Bookmark the permalink.